What’s better than a donut? Two donuts. And a burger. And all the works–served in one convenient order. 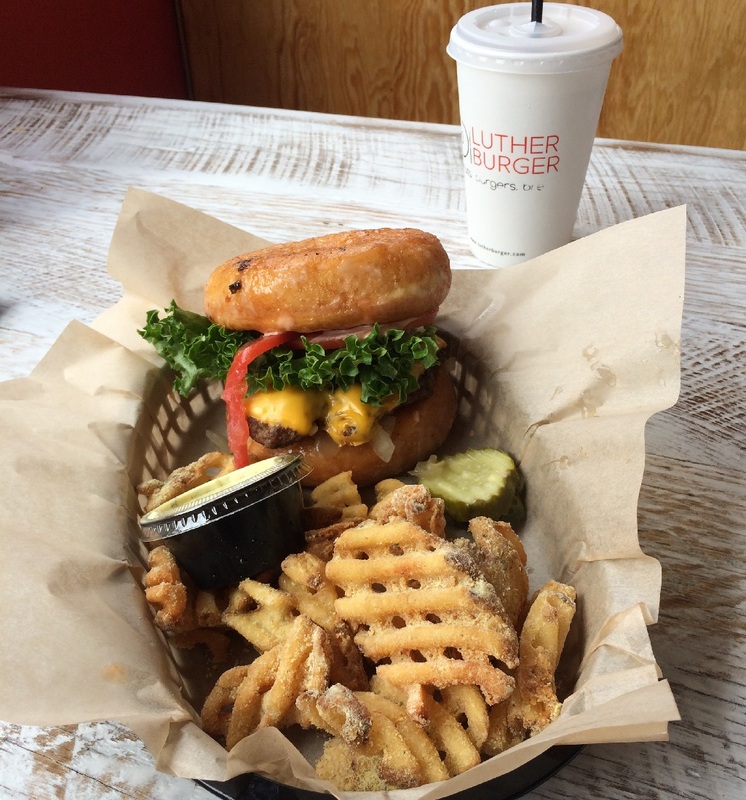 Last month, Richmond-based Sugar Shack Donuts opened new burger joint Luther Burger as an extension of their Chesterfield location at 1931 Huguenot Rd. Along with burgers, beer, and fries, Luther Burger promises to “Luther” any burger for a buck. The Luther Burger–named not for Superman’s arch-nemesis but for singer/songwriter Luther Vandross (get that story here)–is a simple concept. It’s a burger. But in place of buns is two glazed donuts. Despite no real connection to the infamous Lex, there is something diabolically ingenious about it. Two donuts sandwiching a burger is so excessively, gluttonously American that it becomes almost ironic–cementing that trademark Richmond vibe. On my recent visit to the restaurant, I ordered a beef smash burger and Luther-ed it for $6. The burger is exactly what it says on the tin, locally-sourced meat, lettuce, tomatoes, cheese, onions, and sauce served between two Sugar Shack glazed donuts. Even if there were no surprises, I was thrilled with the end result. RVA Mag first told you about Sugar Shack’s plans for the burger joint add-on in our Summer 2017 issue, which is the brainchild of founder Ian Kelley, alongside James Henderson, and Michael Goins. No word if Luther will sprout multiple locations, but Sugar Shack is well on its way to glazing over the entire city and beyond with 10 locations since launching in 2013. The donut shop now has locations in Hanover, Henrico, Alexandria, Arlington, Fredericksburg, two in Florida, Stafford and Virginia Beach. Charlottesville, Washington, D.C., and fellow spots in Chesterfield and Glen Allen are currently underway. But back to the donut burger. It is a complete clash of flavors, but I’m not one to complain when two of my favorite foods are combined in a Frankenstein’s monster-esque love child. The donuts are light, sticky with sugar and glaze, and serve as a bizarre compliment to the patty. It’s a messy eat, best attacked head-on, so invest in some wet-wipes. But if you’re not feeling up to the challenge, their non-Luther-ed burger, served between two Brioche buns, is fantastic. The buns, made from donut dough, are incredibly soft, savory with a faint donut sweetness, and there’s a wide range of options to choose from when it comes to protein–beef, vegan, turkey and crab–all ranging from $5-$7. 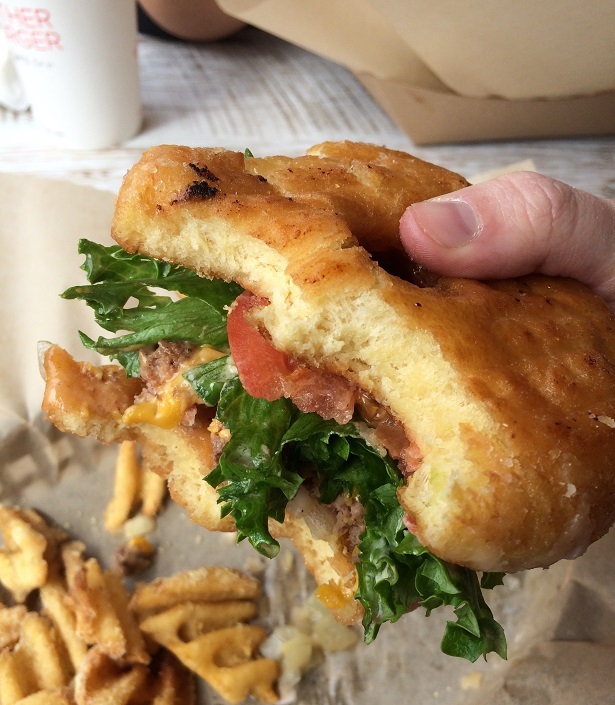 A vegan friend, often disenchanted with vegan restaurant options, declared Luther Burger’s non-meat patty a win. Despite most vegan burgers being a dead giveaway, she said this one was so good she had to get it double-tasted by a friend to be sure it wasn’t meat. It’s exciting to have vegan options outside the city. Alongside my savory, indulgent lunch, came waffle fries, which Luther Burger serves up in more than a dozen flavors, such as Cajun, White Cheddar, and Dragon’s Breath, all to wash down with a milkshake which come in 17 flavors from Butterfinger to Oreo, and Birthday Cake. Though the Chesterfield Sugar Shack/Luther Burger combo location has limited indoor seating, a newly-built outdoor seating area is a charming addition. With aesthetically minimalist plywood benches, string-lights, and dark, painted brick, the booth-style seating promises a fun spring and summer destination. Luther Burger is open every day 11 a.m. to 10 p.m.